As part of my Occasionally Assorted Nonsense theme, I’ll be posting a series of blogs that I’m calling Life & Times In The Middle of Nowhere about my time living and working on the Midway Atoll National Wildlife Refuge. The time I spent on Midway was life altering. I learned to cook on Midway. I accepted that I would never have children on Midway. I learned how few material things I needed to be happy on Midway. I discovered that birds are cool on Midway. I learned that plastics are the scourge of the planet on Midway. I learned how to get over being lonely on Midway. In these installments, I’ll try to bring some humor, history, and awareness to why Midway is so important to me and why it is important to understanding the fate of the planet Earth. Is it brave to put everything you own into storage and schlep out to live for possibly two years on a remote, tiny island populated with under two dozen people and over three million birds? I don’t think so. 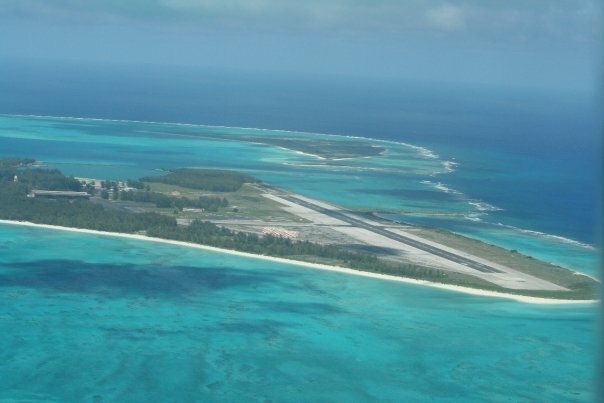 But when I did just that, when I packed up my whole life and locked it away, not knowing when I’d see any of it again, and went to live and work on Midway Atoll, people called me brave. They envied me for going on an adventure. I didn’t feel brave or intrepid or any other word you can dig out a thesaurus for bold. My friends who thought that about me had spouses and children and soccer practice and family vans. I had none of those things. Not even a goldfish to hold me back or leave behind. I didn’t know what Midway would be like when I got there, or how my life would be living there. I just knew it would be different, and different was what I wanted. That was 2002. I had just turned 34. I had never been married, had no children, and the only man I had ever loved had recently married someone who was not me. It wasn’t courage or a sense of adventure that sent me to the middle of the North Pacific Ocean. It was just wanting to be elsewhere. Wherever elsewhere turned out to be didn’t really matter. Over the next two years, I would spend 17 months “on-island”, and I break it up in my mind, and this series, as first tour and second tour. The first tour was about 11 months when I was there by choice. The second tour was after I had requested a transfer off and all the times I had to go back because we couldn’t keep a new manager there. Life on Midway is not for the feint of heart. My first replacement lasted only about 6 weeks. For me, life on Midway was both wonderful and horrendous. I would become fast friends and drinking buddies with a bunch of rough and raucous guys so drastically different than I that I would never have met them anywhere but where we happened to find ourselves. I would be stalked by a creepy Thai who barely spoke English, and be hit on more often than the laundry lady at a men’s prison. I would learn how few material things I needed to have to find happiness. I would find confidence in skills I didn’t know I had. I would be so bored, lonely, and depressed that had a port-a-potty washed up on shore, I’d have done my very best Tom Hanks impression. I would become the person I am today and never could have become without Midway. It’s not easy to get to Midway—then or now. It really is in the middle of nowhere. Just try to find it on a map. There’s a whole lotta ocean around it. It may be argued that it is not the most isolated island on the planet, but it is 1,311 miles from Honolulu. To put that into perspective, if you took the I10 freeway out of Los Angeles and drove east for 1,311 miles, you’d be on the road 20 hours, 40 minutes, and wind up about 80 miles west of San Antonio, TX. It takes anywhere from four to five and half hours on a plane to fly between Midway and Honolulu, and the only thing under you is the blue North Pacific. Midway is not open to the public—then or now. It’s a national wildlife refuge operated by US Fish & Wildlife Service. You must have permission from FWS to enter Midway, and a good reason—unless you happen to be one of the nearly 3.5 million birds that call Midway home, many of which are threatened or endangered. If you are a bird, you don’t need permission or a passport. The refuge also supports endangered Hawaiian monk seals, spinner dolphins and threatened green seal turtles. The rich and varied wildlife make Midway breathtakingly beautiful, even if it does usually smell like the bottom of a slightly neglected birdcage. Before dawn, on June 1, 2002, I stood on the ramp at Coast Guard Air Station Barbers Point, looking with excitement at the big, beautiful C-130 that would take me to my distant new home. I’m a prop-head. I like airplanes. That’s how I ended up running airports, because you tend to see a lot of airplanes at airports. And military aircraft are, in my opinion, the eye-candy of airplanes. I, and about a dozen other folks comprised of my staff, refuge staff and communications techs, was going via the Coasties because the airport on Midway was closed at that time. It is illegal to land an aircraft on a closed airport, unless you happen to be on fire or coasting like a brick without engine power. Or, if you’re a military aircraft with a good reason and get prior permission. In this case, the good reason was so that I could re-open the field the minute I stepped off the plane. But before I stepped off that plane, before I even boarded that plane, I’d feel the slight embarrassment of watching the Coast Guard crew load my seven pieces of busting at the seams luggage onto a cargo pallet and into the cargo bay. Busting with at least a dozen pairs of shoes, two years worth of make-up, hair product, and half the Bath & Body Works shop. Granted I also packed about two dozen books, a boom box, and a dozen of my favorite CDs. But who brings a dozen pairs of shoes (some of them strappy wedge heals) to an island with more birds than a Hitchcock movie? I did. In my defense, I thought I might be on Midway for up to two years and had no idea how easily I might be able to get the things I needed. Like tampons. Not an eventuality I was willing to bargain with. But the shoes ultimately proved worthless, I stopped wearing make-up or styling my hair, altogether. And I ended up having so much fun that I hardly cracked a book the whole time I was there. I didn’t know that on this that chilly June morning, though, and it’s a good thing the C-130 is a heavy lifter. Speaking of which, the Lockheed C-130 Hercules, or Herk, beyond being a heavy cargo plane has versatility and plasticity to allow it to excel as troop transport, search and rescue, gun ship, low altitude parachute extraction platform, fuel tanker, and fire fighter. It’s strong as an ox, can land and take off on short runways, or no runway, and in combat. And it can carry an awful lot. We had about 7,000 pounds of food, mail, my shoes and Clinique. I damn near floated aboard. I’d never flown in a military aircraft before and felt like I was going to Disneyland. But there aren’t any rides at Disney like this. Bumpy and loud. Freezing-cold conditioned air streaming out of gaping, gridless vents. Very few windows, except in the cockpit, and those windows that are accessible to passengers are not more than portholes. First class it ain’t. Did I mind? Not even the tiniest little bit. I was on a Herk! The bathroom on our plane was not a bathroom. Hell, it wasn’t even a room. The “head” was just your standard toilet set on top of this little platform with the equivalent of a shower curtain you pull around yourself for privacy. I, being the only female on board, was also the only one with enough moxie, a small enough bladder and scrawny enough to climb around the cargo to actually brave the turbulence and a swinging curtain for a much needed pee. The loadmaster was gallantly courteous when he saw me heading for the head. He left me alone in the aft of the aircraft and then guarded the crawl space between the hull and cargo so I could privately perform my balancing act, two feet firmly planted, one hand clutching the toilet seat and the other the curtain. After about four and half hours we were approaching Midway. Mr. Gallant, aka the loadmaster, gathered us all together to give us our pre-landing briefing. No tray tables and seat backs in their upright position on Coast Guard Air. No send your empty drink cups to the aisle to be collected by the flight attendant. No, here on Coast Guard Air, the pre-landing briefing goes like this. I’m sorry…it’s a bit loud, what with that gigantic turboprop engine turning 20 feet from the hull I’m sitting near…did you just say ditch, survival and bail? Great, that’s what I thought you said.